Starmada Command had launched a distress probe deep into the heart of the NBS in hopes of attracting the attention and participation of the local alien life. We launched from the Buttonwood Constellation to rendezvous with respondents at the Luna Star Store and set out on a patrol route along the recently discovered Blue Lane Wormhole. We were joined by a suspected Time Lord, responding to the codename "Ladybug" but we know better, Doctor... WINK! Her TARDIS was cleverly disguised as a civilian ship, aptly named "Werther's Original". Exploration of the new super-wormhole yielded some very interesting findings. 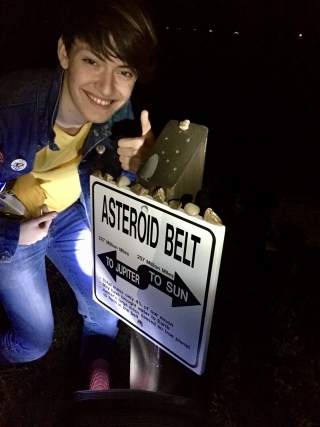 We found that it spans the shoreline of the Acushnet Asteroid Belt, connecting the system's CoveWalk, HarborWalk, and RiverWalk wormholes, respectively. Finally, our trek across the stars took us to the shrunken planets of the Sol System, which have been scattered along the Saulnier Memorial Wormhole. We had received word that the miniaturized asteroid belt had mysteriously vanished! Our mission was to explore the Blue Lane Wormhole, scan the Sol System for spacial anomalies, and replace the missing asteroid belt before heading back to the dNB Sector. Luckily, our team was able to complete all mission objectives ahead of the impending disaster, which was about to befall us. We had just installed our replicated asteroids in a belt-like fashion (Did we make it better or worse?) when suddenly, Mad Owl's potassium modulator system sprung a leak, spraying Angry Candy's hull with dampening fluid, causing the propulsion transfer conduit to seize! He had previously transmitted word of this malfunction to the mission leader, prompting DAdm Civitron to formulate an burn-up strategy for the ailing pilot. Upon exiting the Star Cove Nebula, we took one final shore leave at the Luna 7-11 and encountered a nexus of transport pilots, all laughing and smelling of burnt plastic. While we did not seem to appear on their radar screens, we quickly decided that this would not be a suitable location to rendezvous with our drop ship. So, we flew further along the starway to a Luna Burger King. At this point, our young pilot's propulsion array was at risk of breaking down permanently (but not really. I'm trying to make this sound exciting). TurboHoney stood sentry while Civitron flew back to Fort Jonathan to retrieve the emergency transport that would carry all remaining ships and pilots back to Starchasers headquarters for radiation treatment and banana molecules.